Sometimes an answer doesn't come in one go. Sometimes it has so many layers to it that it takes time for the person to tell you what they really mean. Ten-year old Alex Connolly's best friend is a demon. A 9000-year old demon called Ruen. He sees other demons too, occasionally, and sometimes they laugh at him or his mom but he ignores them. He only speaks to Ruen, who sometimes controls or bribes him to do things he doesn't want to do. Like hurt or kill people. When Alex's mom attempts suicide and is taken to a psychiatric facility to be treated, Alex's social worker, Michael, tries to arrange a suitable alternative for Alex. Unfortunately for him, the psychiatric facility has other plans for Alex. Dr. Anya Molokova has been assigned Alex's case. Even though Michael is against separating mother and son, Anya brings her own baggage to the decision table. Having lost her daughter by not seeking enough professional help, she is determined not to repeat that mistake with Alex. But Alex begins to talk about things that only Anya knew about - things about her daughter and her life with her. Things that Alex says Ruen is sharing with him. Things that make Anya wonder whether Ruen might be real after all. 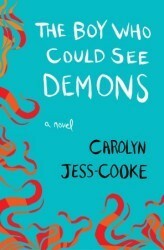 The Boy Who Could See Demons was one of the books that helped me get out of my reading rut, a few months back. It was suspenseful, well-written and fast-paced. Told in alternating viewpoints, from Alex's and Anya's perspectives, the book tackled mental illnesses and how it affects a person's life and deeds. Both narrators are unreliable. Both are dealing with issues that bias their narratives. Alex loves his mother dearly and would do anything to assure her safety and happiness. When Ruen suggests dangerous ways to make that happen, a reluctant Alex is willing to give those a go. Anya is still reeling from the tragedy of losing her daughter to schizophrenia. She thinks she knows exactly how to treat this illness in other children but her experiences are clouding her opinion and she is unwilling to listen to others. To add to the unreliability of the narrators, there is a demon that Alex can see and who seems to know things that Anya hasn't shared with Alex. She begins to wonder if a real person is feeding Alex with some of the details. I love reading books with unreliable narrators, and when done right, such books can totally twist your brain. This one has two and that makes it all the more intriguing. At every point through the book, I was highly puzzled - how does Ruen know so much? Could this be a fantasy story after all? Or is there something I was missing? I was leaning more towards the latter but I never guessed the ending. Although I thought the ending was too rushed after the nice pacing of the rest of the book, I thought it was still very fitting. It made me want to read a prequel or a sequel, something that would put me back in the world of these characters, just so that I can see them again with new eyes. The Boy Who Could See Demons is sort of like Shutter Island. If you liked the latter, this one is just up your alley. It kept me guessing throughout the book and I love it when a book does that. I received this ebook for free for review from the publisher via NetGalley. I remember seeing this one on NetGalley and thinking it sounded really interesting - you definitely caught my attention now! I have never heard of this book, and I've never read Shutter Island but now I am intrigued (and a little creeped out). Mental illness in books terrifies me because you never know what is going to happen or how it will be "treated". I'm definitely adding this to my TBR! I like unreliable narrators too. This book sounds kind of creepy. This is a fascinating read. I hope you give it a try. I hope you enjoy it. This one isn't as intense as some other mental illness books I've read. It actually isn't. Probably my review is, lol. I was actually thinking that you will enjoy this one. It seemed right up your alley. Yeah - that's exactly what this book did. Intriguing, when the line between truth and fantasy becomes blurred. I like these kind of books. And I liked Shutter Island, too. This one is probably just up your alley then!